The map that precipitated the slaughter of Col. Custer at Little Big Horn. 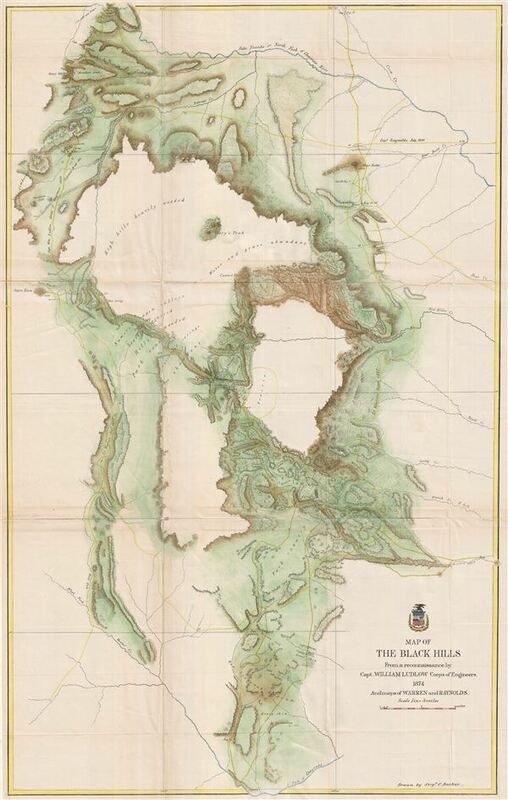 Map of the Black Hills From a reconnaissance by Capt. William Ludlow Corps of Engineers, 1874 And maps of Warren and Raynolds. George Armstrong Custer and William Ludlow's seminal 1874 map of the Black Hills, Dakota Territory, covering from the Missouri to the Powder River and from the 47th to the 43rd parallel. In 1874 one thousand cavalrymen under the command of Lt. Col. George Armstrong Custer moved into the Black Hills region of Dakota Territory. Though officially American Indian territory according to the 1868 Treaty of Laramie, rumors had been circulating since the early 19th century that this region harbored rich deposits of gold. Custer and his men were sent to investigate. With Custer was William Ludlow, an officer of the Army Corps of engineers (inheritor of the legacy left by the Topographical engineers) whose commission was to explore and survey the region, identifying in the process if the rumored gold did indeed exist. Ludlow and Custer traveled west from Fort Lincoln on the Missouri River (near Bismarck) to the Powder River, thence north and South into the Black Hills. Their path, many camp sites, and survey triangulation points are documented throughout. Ludlow compounded his work by attaching it to pre-existing exploratory survey work performed by Reynolds in 1859-60, Warren in 1857, and Sully in 1864, and to the Northern Pacific Railroad Surveys performed in 1871 and 1872, all of which are noted. Ultimately, Custer and his men did find gold in the Black Hills, leading to the 1876 Black Hills Gold Rush. Completely disregarding the Treaty of Laramie, gold hungry settlers rushed into the region, coming into immediate conflict with the warlike Sioux, setting the stage for the Great Sioux War of 1876. Custer's foolish attack on the Sioux encampment and the subsequent massacre at Little Big Horn were a direct result of this conflict. Ultimately the Black Hills gold discovery turned out to be one of the greatest gold strikes in history, producing 10% of the world's gold supply for the next 125 years. This map was issued to accompany the Report of Reconnaissance of the Black Hills of Dakota, made in the summer of 1874, of which only 2500 copies were printed. William Ludlow (November 27, 1843, - August 30, 1901) was an officer in the Corps of Engineers and a major general in the United States Army who served in the American Civil War, the Plains Indian Campaigns, the Spanish-American War, and led a scientific expedition examining the natural wonders of Yellowstone National Park. Ludlow was born in Islip, Long Island, and attended both the City University of New York and the United States Military Academy at West Point. Ludlow excelled at engineering and science and, upon graduation, was immediately assigned to the Army Corps of Engineers. During the American Civil War he served on the staff of General Sherman and participated in both Sherman's March and the Carolina Campaign. Following the Civil War, Ludlow was ordered to the staff of Lt. Col. George Armstrong Custer, who had been dispatched to the Black Hills of Dakota to search for gold. Unlike Custer, Ludlow survived the Black Hills and went on to a distinguished military career, serving in Cuba and in the Philippines before taking an honorable retirement. Ludlow retired to Convent, New Jersey, where he died at 56. He is buried in Arlington National Cemetery. Army Corps of Topographical Engineers (fl.1838 - 1863) refers to the an elite branch of the U.S. Army created on July 4, 1838 to perform civil mapping and survey work throughout the United States. The origins of the Corps of Topographical Engineers can be traced back to the American Revolutionary War, where General George Washington recognized the need for accurate surveys pursuant to military action. Shortly following the war, in 1779, a civilian engineering corps was created by act of Congress. Identified in 1802 by Thomas Jefferson, the "Corps of Engineers," which was based at West Point, the group participated in the War of 1812 and in later in the fortification of New Orleans. It was not until 1838, however, that a separate group of "Topographical Engineers" was formally recognized. This elite group, consisting only of officers, most of whom were trained in surveying and engineering by the esteemed Andrew Ellicott at West Point, never numbered more than 36 individuals - the best and brightest. This small but determined group played a central role in the mapping and exploration of the American West. Few branches of the military can boast such a distinguished alumni. Their names resonate throughout the map of the west and include John Charles Fremont, Zebulon Pike, George Meade, Kemble Warren, William Amiel Weeks, A. B. Gray, Randolph B. Marcy, James H. Simpson, Howard Stansbury, John W. Gunnison, William Ludlow, and Robert S. Williamson. The onset of the American Civil War brought an abrupt end to the surveying activity of the Topographical Engineers. Many of the most prominent engineers went on to distinguished military careers on both sides of the War Between the States. The Army Corps of Topographical Engineers itself was folded into the Corps of Engineers on March 31, 1863. Though the Army Corps of Engineers continues to do military and civil survey work to this day, the elite club of adventures that formed the Topographical Engineers were no more. Ludlow, W., Report of Reconnaissance of the Black Hills of Dakota, made in the Summer of 1874, First Edition (Washington, 1875). Very good. Original fold lines visible. Minor wear along folds. Verso reinforcement over folds. Blank on verso. Professionally flattened and backed with archival tissue. Wheat, Carl Irving, Mapping of the Transmississippi West, 1540-1861, 1248. Realms of Gold: A Catalogue of Maps in the Library of the American Philsosphical Society, 1393.